The daycare uses a specialized food service to provide safe and nutritious food to our children. 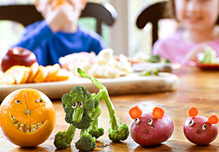 Canada’s Food Guide regulations will be respected in your child’s plate. Both snacks and a hot or cold meal are served every day.